Initial knowledge regarding group size can be crucial for collective performance. We study this relation in the context of the Ants Nearby Treasure Search (ANTS) problem , which models natural cooperative foraging behavior such as that performed by ants around their nest. In this problem, k (probabilistic) agents, initially placed at some central location, collectively search for a treasure on the two-dimensional grid. The treasure is placed at a target location by an adversary and the goal is to find it as fast as possible as a function of both k and D, where D is the (unknown) distance between the central location and the target. It is easy to see that T = Ω(D + D 2/k) time units are necessary for finding the treasure. Recently, it has been established that O(T) time is sufficient if the agents know their total number k (or a constant approximation of it), and enough memory bits are available at their disposal . 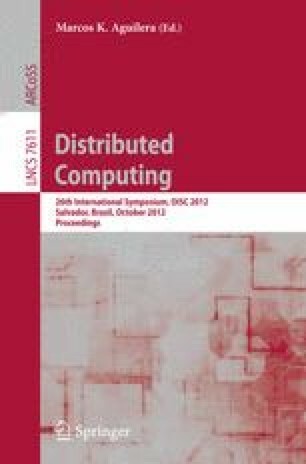 In this paper, we establish lower bounds on the agent memory size required for achieving certain running time performances. To the best our knowledge, these bounds are the first non-trivial lower bounds for the memory size of probabilistic searchers. For example, for every given positive constant ε, terminating the search by time O(log1 − ε k ·T) requires agents to use Ω(loglogk) memory bits. From a high level perspective, we illustrate how methods from distributed computing can be useful in generating lower bounds for cooperative biological ensembles. Indeed, if experiments that comply with our setting reveal that the ants’ search is time efficient, then our theoretical lower bounds can provide some insight on the memory they use for this task.